The School Holiday Winter 4 Seasons Learnscapes program is over for this year and a great time was had by all who came along. Please Note: We are closing for the next 2 weeks and taking the opportunity to repair our flood damaged driveway ready for the Spring season. Our Spring Equinox weekend is 21-22 September 2013. Saturday is a special celebration of the Equinox with Vikki Cunningham. Sunday the 22 September is the day for Fairies. 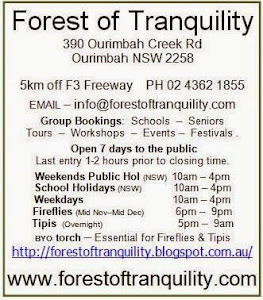 Come in your fairy clothes or join a workshop. More details posted later. Mark your calendars for the Opening of Fire Fly Magic 16 November. Costumes mandatory. Bookings essential.We'll be keeping you posted in advance of this extraordinary season and you won't want to miss this experience. Considered the best surviving rainforest in the Sydney region, the Forest of Tranquility - Australian Rainforest Sanctuary is structurally a warm temperate rainforest which contains almost 200 rainforest species, is home to almost 200 species of rainforest flora, and sanctuary to more than 126 species of native birds.